You can use WIC Reset Utility under Linux. 1. Differences between /dev/usb and /dev/bus/usb. In the Linux system same devices may be presented on the different levels of the /dev directory, each of them using different drivers stack. For example inkjet printer can be accesed from the /dev/usb/lp0 and /dev/bus/usb/002/004, but in the first case it's actually a printer (line printer 0) and in the second - generic usb device. WIC Reset will work only in the first case, thus creating aliases from /dev/bus/usb to /dev will not help to solve any problems and can be potentially harmful. 2. Access rights. Read me! 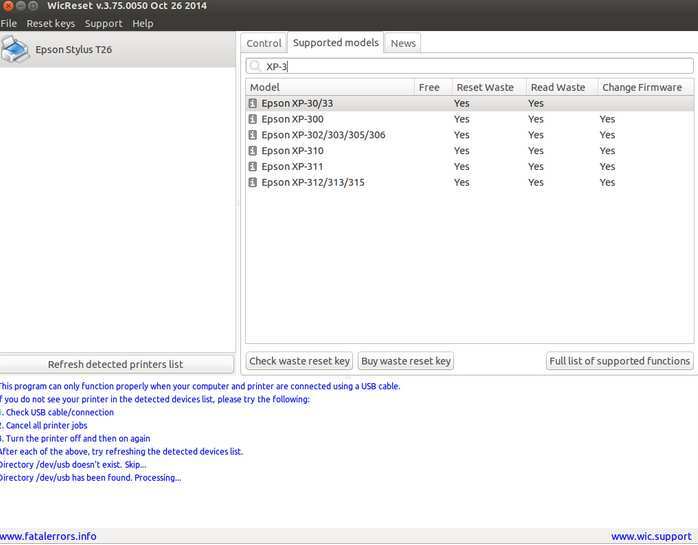 Thus only root and members of `lp` group can access the printer. There several ways to deal with this problem. 2.1. Add user to the `lp` group. 2.2. Change access rights for single printer. Running application using root account may be dangerous. You can use su, sudo or gksudo from gksu package. When sudo is used system will not change user directory which may cause some warnings. On the other hand gksudo will always use root directory. In both cases all files created by the application will belong to the root, and therefore will be inaccessible by regular users. Also when application started using sudo or gksudo in KDE, GTK is unable to properly initialize all necessary resources. You can change default access rights for the printer using device manager. For more details read udev manual page and this article: Writing Udev Rules by Daniel Drake. You can install WIC Reset either from console or using package manager. Install package using `dpkg` command from the directory, where package has been downloaded. Fix missing dependencies using `apt-get`. 3.2. Installation from package manager. Derived distributions (Kubuntu, Xubuntu, Lubuntu, Edubuntu, etc.) should be supported as well. 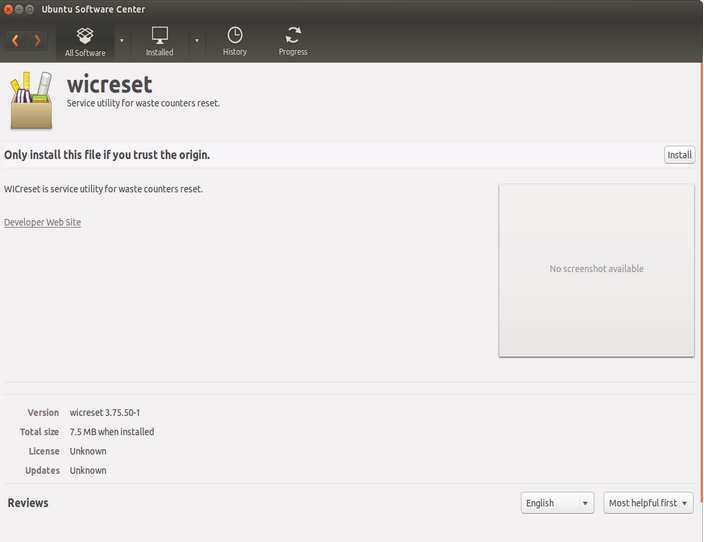 Would it be possible to have wic reset for the latest version of ubuntu? The latest version is Ubuntu 18. Unfortunately, we unable to provide new version right now due to heavy refactoring in progress, but it may be possible to install current version of the package. First you need to download and install this package https://packages.ubuntu.com/xenial/libpng12-0 manually.